“Player VS Non Player Character,” the last episode of Overlord’s first season, answered some questions but hinted at the answers for others. I’ve waited to post anything to give myself some time to digest the episode. I’m not sure the extra time helped! The episode breaks down into three sections. Unsurprisingly, we start the episode where the last one left off: with Shalltear Bloodfallen facing off against Ainz Ooal Gown amid the devastation their battle had wrought on the land around them. Confident in her performance, Shalltear asked him if he had any last words, and he calmly explained to her how she had fallen into his trap. And then he demonstrated how. He used the weapons his friends, other “supreme beings,” had left behind. I think Shalltear thought she could prevail — until she saw her creator’s bow in Ainz’ hands. Capture from Funimation’s stream. Before Ainz administers the finishing blows, however, the narrative returns to Nazarick where Albedo, Demiurge, and Cocytus are watching the fight. Analyzing Ainz’ tactics drove their admiration for him even higher. I still get the sense that they are fully aware that they are creations, but they seem to embrace the role rather than lament it. I also think Ainz senses his responsibilities as a creator. This kind of dynamic keeps me interested in Overlord. At about the 10 minute point, Ainz unleashes his final attack that forces Shalltear to discorporate. I wasn’t sure what her last word, “Shorty,” meant. According to the Overlord wiki, “Shorty” was a nickname for Evileye. However, in a comment to a Youtube video chronicling the live reaction to this episode, AzureDrag0n1 pointed out the nickname probably referred to Aura. That theory makes sense to me, because just before Ainz unleashed his final attack, Shalltear and Ainz saw an eye appear briefly just behind the vampire (a point that AzureDrag0n1 pointed out). That makes sense to me, because Ainz’ final attack was a little slower than it needed to be, and that eye caused Shalltear to pause for a critical split second. 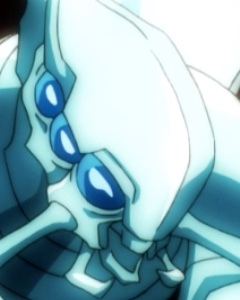 Cocytus, Demiurge, and Albedo watched the battle from the tomb. Capture from Funimation’s stream. The second part of the episode begins with all of the floor guardians in the throne room. They’re surrounded by the gold Ainz needs to resurrect Shalltear. Before beginning the rite, he tells Albedo to watch for Shalltear’s name to reappear on their roster; the color of the text will tell if she’s still mind-controlled and therefore in rebellion against them. Ainz, as always, intended to deal with the rebellion himself, but Demiurge spoke up, supported by Albedo, saying that the floor guardians would take the lead this time. Demiurge had been angry that Albedo and Cocytus “allowed” Ainz to take on Shalltear in the first place. Now, he was able to convince Ainz to take himself out of the path of danger. Albedo sealed the deal when she said that if he were gone, they’d have no one to pledge their loyalty to — and that they would be lonely without him. He hesitated, but in a sign that he was sincerely cares about them, he relented, agreeing, “It’s lonely when everyone is gone.” For me, that statement set the tone for this section. I really got a sense that as much as Ainz loves the floor guardians, he misses his friends — who had already left the game by the time the servers should have shut down. At this point, he has no idea if he’ll ever see them again. The resurrection spell converted the 500,000,000 in gold to Shalltear. She awakens naked, of course, and before he tries to talk to her, Ainz gently places a cloak over her — but only after asking Albedo to confirm that Shalltear was no longer under mind control. Then he cradles her in his arms and apologizes for his decisions placing her in danger. Honestly? I wasn’t fully convinced she was free of the mind control until she said that. They quickly ascertain that Shalltear doesn’t remember anything that would help them find out who used a world-tier item against her. One of the funniest moments in the episode came after Ainz asked Shalltear if she felt different. Shalltear expressed dismay when her post-resurrection figure didn’t match the pre-resurrection figure. Capture from Funimation’s stream. She touches her shoulder and face and said everything seemed fine. That is, until she looked down and screamed! She discovered her chest had diminished! So apparently the resurrection spell wasn’t 100% effective. The other floor guardians scold her for worrying about something so trivial when she had put Ainz through such a crucible. Ainz sits on the dais to watch. For a moment, he sees the character of his friends, the floor guardians’ creators, through the actions and attitudes of their creations, and I felt a longing in him to be with his friends again — or to join in with his NPCs. He hesitates, clearly uncertain if he belongs with them in that context. Albedo sensed his uncertainty, so she took him by the hand to lead him to the group under the auspices of scolding Shalltear. Laughing, relieved that he has a place with them, he reaffirms that he’s at fault, and no one else. He then sets the stage for the next conflict: Sebas and the Pleiades Solution are still in the field acting as bait. Ainz was still furious that someone had targeted his people, and he was going to put an end to the threat. 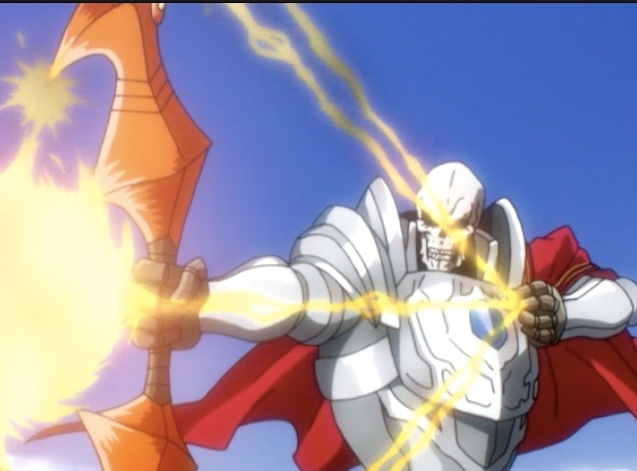 Before that, Ainz told his people that the wanted to reinforce the defenses around Nazarick. He’s at a loss at how to improve their forces, because his skill of creating undead would result in human undead of only level 40. Albedo steps up to help by saying there was a city of lizard people nearby — apparently, after being defeated, their undead would make much more powerful warriors. After the “ahh, that’s nice” scene following Shalltear’s resurrection, this was a jolting reminder that Ainz and his people live in a dangerous, cruel world. Apparently, the Slane Theocracy will play an important role in the next season of Overlord — which I hope a) we’ll see and b) starts soon. Capture from Funimation’s stream. This scene also contained discussion of Slane Theocracy internal politics, which while interesting, felt like they came out of nowhere to me. 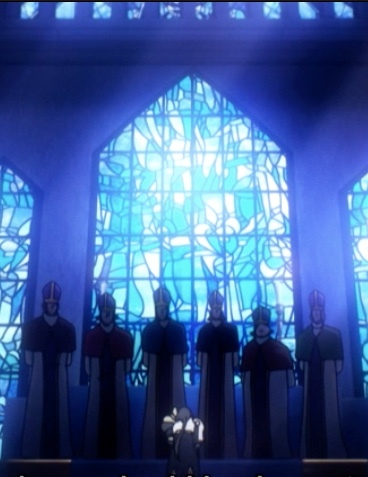 The rest of the episode, too, where Nabe hands off guardianship of Nfirea and his grandma to the Pleiades Lupusregina at E-Rantel, as well as Momon/Ainz and Nabe continuing their quest to increase Ainz’ reputation, felt rushed. On the other hand, it delivered the information it needed to. Maybe I just wanted to see more dramatization of the information delivered, which to me is a sign that I was really into the story. I hate that the first season has come to an end, but I’m glad to have watched it. Here’s hoping for a second season. And soon!